The Japanese art of paper folding is obviously geometrical in nature. Some origami masters have looked at constructing geometric figures such as regular polyhedra from paper. In the other direction, some people have begun using computers to help fold more traditional origami designs. This idea works best for tree-like structures, which can be formed by laying out the tree onto a paper square so that the vertices are well separated from each other, allowing room to fold up the remaining paper away from the tree. Bern and Hayes (SODA 1996) asked, given a pattern of creases on a square piece of paper, whether one can find a way of folding the paper along those creases to form a flat origami shape; they showed this to be NP-complete. Related theoretical questions include how many different ways a given pattern of creases can be folded, whether folding a flat polygon from a square always decreases the perimeter, and whether it is always possible to fold a square piece of paper so that it forms (a small copy of) a given flat polygon. Krystyna Burczyk's Origami Gallery - regular polyhedra. The business card Menger sponge project. 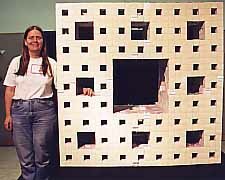 Jeannine Mosely wants to build a fractal cube out of 66048 business cards. The MIT Origami Club has already made a smaller version of the same shape. Cardahedra. Business card polyhedral origami. Cranes, planes, and cuckoo clocks. Announcement for a talk on mathematical origami by Robert Lang. Crumpling paper: states of an inextensible sheet. Cut-the-knot logo. With a proof of the origami-folklore that this folded-flat overhand knot forms a regular pentagon. Einstein's origami snowflake game. Rick Nordal challenges folders to make a sequence of geometric shapes with a single sheet of origami paper as quickly as possible. Folding geometry. Wheaton college course project on modular origami. Geometric paper folding. David Huffman. Rona Gurkewitz' Modular Origami Polyhedra Systems Page. With many nice images from two modular origami books by Gurkewitz, Simon, and Arnstein. How to fold a piece of paper in half twelve times. Britney Gallivan took on this previously-thought-impossible task as a high school science project, worked out an accurate mathematical model of the requirements, and used that model to complete the task. Knotology. How to form regular polyhedra from folded strips of paper? The Margulis Napkin Problem. Jim Propp asked for a proof that the perimeter of a flat origami figure must be at most that of the original starting square. Gregory Sorkin provides a simple example showing that on the contrary, the perimeter can be arbitrarily large. Mathematical origami, Helena Verrill. Includes constructions of a shape with greater perimeter than the original square, tessellations, hyperbolic paraboloids, and more. A mathematical theory of origami. R. Alperin defines fields of numbers constructible by origami folds. Mostly modular origami. Valerie Vann makes polyhedra out of folded paper. Number patterns, curves, and topology, J. Britton. Includes sections on the golden ratio, conics, Moiré patterns, Reuleaux triangles, spirograph curves, fractals, and flexagons. Origami: a study in symmetry. M. Johnson and B. Beug, Capital H.S. Origami & math, Eric Andersen. 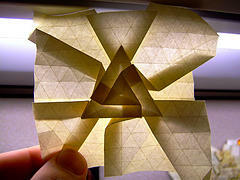 Origami mathematics, Tom Hull, Merrimack. Origami Menger Sponge built from Sonobe modules by K. & W. Burczyk. Origami polyhedra. Jim Plank makes geometric constructions by folding paper squares. Origami proof of the Pythagorean theorem, Vi Hart. Origami Tesselations. Geometric paperfolding by Eric Gjerde. Origami tessellations and paper mosaics, Alex Bateman. The Origami Lab. New Yorker article on Robert Lang's origami mathematics. Ozzigami tessellations, papercraft, unfolded peel-n-stick glitter Platonic solids, and more. Paper folding a 30-60-90 triangle. From the geometry.puzzles archives. Paperfolding and the dragon curve. David Wright discusses the connections between the dragon fractal, symbolic dynamics, folded pieces of paper, and trigonometric sums. Pleats, twists, and sliceforms. Some links to Richard Sweeney's fractal paperfolding art, via dataisnature. Polyhedra plaited with paper strips, H. B. Meyer. See also Jim Blowers' collection of plaited polyhedra. Puzzling paper folding. An amusing origami polyabolo eversion puzzle. Rabbit style object on geometrical solid. Complete and detailed instructions for this origami construction, in 3 easy steps and one difficult step. The RUG FTP origami archive contains several papers on mathematical origami. Spidron, a triangulated double spiral shape tiles the plane and various other surfaces. With photos of related paperfolding experiments. Spring into action. Dynamic origami. Ben Trumbore, based on a model by Jeff Beynon from Tomoko Fuse's book Spirals. Studio modular origami, geometric paper art. The tea bag problem. How big a volume can you enclose by two square sheets of paper joined at the edges? See also the cubical teabag problem. Tobi Toys sell the Vector Flexor, a flexible cuboctahedron skeleton, and Fold-a-form, an origami business card that folds to form a tetrahedron that can be used as the building block for more complex polyhedra. Trisecting an angle with origami. Julie Rehmeyer, MathTrek. Unfolding polyhedra. A common way of making models of polyhedra is to unfold the faces into a planar pattern, cut the pattern out of paper, and fold it back up. Is this always possible? Vegreville, Alberta, home of the world's largest easter egg. Designed by Ron Resch, based on a technique he patented for folding paper or other flat construction materials into flexible surfaces. Joseph Wu's origami page contains many pointers to origami in general.